The OS uses the Filesystem to store data on the harddisk. They are different types of file storage, NTFS, FAT and etc. Commands to get your through! pwd ==> Prints the working directory you are in. find location -type f -name filename ==> to find the file that you have been looking for. history ==> very important to see what all commands have been run. sleep 30 ==> to lock the terminal from taking any input for a certain amount of time. whoami ==> if you suffer from short term memory loss :) this helps you to know what is the log in you are using currently. nohup ==> prefixing it in front of a command makes the process to be immune to any futher signals until the completion of the task. & ==> appending this to a command runs it in the background. fs <job_number> ==> brings the process to foreground. [million $ question is what is the difference between a job and a process? 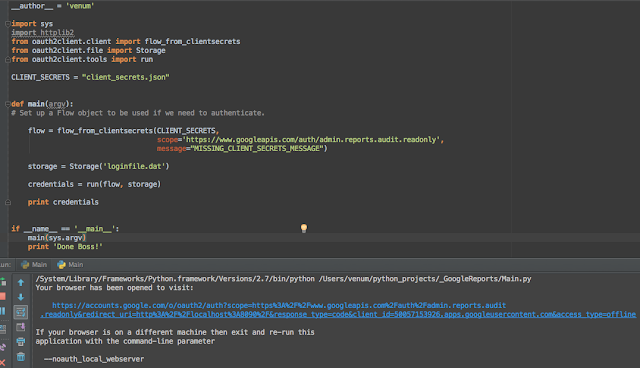 In its simplest form, Oauth is as in this document I had created earlier. Oauth is such a simple protocol and so much of fuss is being made about it, its so simple that you can understand it even by reading its Specification documentation! Authentication and Authorisation are two different things, here we will cover authorisation. 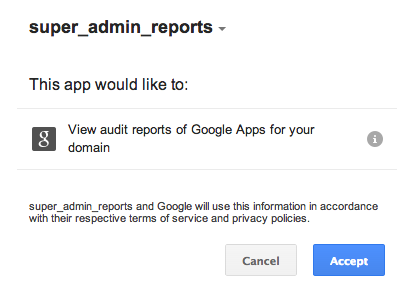 on the API Access pane of the Google APIs Console. Google recommends that we use client libraries as they are safe hence we will be using the oauth2client-module. Which is already there within the Google's Client Library. Before we go ahead, lets discuss the "flow"
First using the Flow we will get credentials which can access a certain service and that will be stored. This is used to acquire credentials that authorise our app (to access user's data). In order for a user to grant access, OAuth 2.0 steps require your application to potentially redirect their browser multiple times. Lets see below how the flow object is instantiated using the flow class. you can download a client_secrets.json file from Google API console for your app and place it in the folder where the python script is located. Though as per the flow, Credentials should have been the next topic, we just have a place holder for the credentials to be defined. this command will create a file by that name, and have the credentials stored into it for further transactions. The Flow object can create the Credentials for you. A Credentials object holds refresh and access tokens that authorize access to a single user's data. Now to avoid having to go through the process of going to a browser and authorising this app always, what we can do is check if there are already some credentials in the stored file and if they are there use, them else create a new one. # Save the credentials in storage to be used in subsequent runs. Finally, using these credentials we have got! These objects are applied to httplib2.Http objects to authorize access. httpplib2.http is used to place requests to the web, see the below screenshot, where I am just trying to get the unauthenticated page, like Google. We need method to the madness! Manifesto for Agile Software Development was produced in February, 2001. Is more pragmatic, as it knows that not everything can be documented at the beginning of a project. But it does put in place some rigorous checks to accommodate these changes! So that any change can be accommodated, with good communication, iterative design and development. Agile development can be applied in any project, both testing tools and build automation tend to be very language specific. Python too has these tools. there could be many more. Spirit of it from manifesto! on-site customers - person using the product. pair programming - being a solo role since the beginning of my career I know how it feels to be banging your head alone to a computer, its better for two to be doing this. sys metaphor - using the same names all around the program and treating anything else as bugs, IDEs refactoring tools help in changing names across the system. IDEs are integrated development environments, like Pycham, Eclipse and etc. Refactoring is the practice of simplifying and clarifying code when ever possible. Documentation - yes you read it right! there is documentation too but it should be minimal. It should be limited to that which is necessary to ensure that participants in the development process can communicate. Simple Design is fulfilling requirements of the user stories and nothing more. the code is the design, should be as simple as possible. - DRY - Don't repeat yourself, when you see the same thing being done again and again in your code, refactor! May be create a method or something also called as DIE - duplication is evil. - YAGNI - "You aren't gonna need it" -- "do the simplest thing that could possibly work" (DTSTTCPW) no point in carrying the useless burden around. - KISS: is an acronym for the design principle "Keep it simple, Stupid!". Better raw than wrong - just say things in simple and direct way. Short Iterations - The customers and the dev team meets on regular intervals, generally every week and discussion on what has been done, give a demo may be and then plan for what needs to be done in the coming week. This is to avoid any tragic surprises to the client. Collective Code Ownership - it's not one man or his fathers property, due to pair programming, the strong attachment to the code is dissolved. Producing short iterations is made possible through automation. There is automation from the Developers desk to the production environment. Human touch is only needed when things go wrong! It is human to err and hence manual process should be avoided. Continuous reflection: Is ongoing analysis of how development is going on. documenting everything that is being done can CYA! Trust me, I've realised this in the hard way, so no matter which company you are in keep shouting and bragging on what you are doing and if possible give them some jazzy acronymos or create a buzz word so that others are intimidated on hearing it. This is how this God forsaken industry operates unfortunately. Have you saved the file, or do you have a back up, if this words make your heart skip a beat then you should remember to check in the code into the repo as often as possible as a single place keep all the artifacts necessary to produce the build. This could include build scripts, tool scripts, properties files, installation scripts, third-party libraries, tests, and tool configurations (e.g., IDE configuration files). Since the program is built, installed, executed, and tested throughout development. This guarantees that there will be no deaths in the team at the time of production! Tests are written before the actual code is written to solve the problem. Unit tests or programmer tests is level of methods and functions. With this tests changes are easy to make as they detect the bugs immediately. Unit tests fall into two broad categories: programmer tests and customer tests. What they test distinguishes them from each other. Programmer tests prove that the code does what the programmer expects it to do. They verify that the code works. Customer tests (a.k.a. acceptance tests) help to ascertain that the code behaves the way the customer would expect it to. It verifies behaviour at the level of classes and complete interfaces. Unit testing is a part of regression testing. Regression tests identify bugs that have been seen before and that had been fixed. Unit tests should run fast else, programmers will not run them and that could lead to a lot of bugs at the end. Two of the most common tools in Python for unit testing are unittest and Nose. Functional testing verifies that the complete application works as expected. Functional testing is done by QA department who are directly integrated into the development process. It verifies that customer sees what they would expect to see and no bugs have crept in. I still haven't got Agile, what the heck is it? It simply means that you will have the requested app or program at the earliest even though it might not have the full functionality of the finished application! From the past 4 years I've been unfortunate enough to work on Google API's which are those for which even Google cannot search their documentation, may be because it doesn't exist, stackoverflow no matter how much it overflows cannot give us anything much on these. Below is the summary of all my experience to crack the Google APIs. I've spent days together to crack one thing at times and I wished I had known these tricks so that it wouldn't have taken me this long. But the world of python is different! dir() - To list the names of built-in functions and variables. For example if you have a class and instantiated an object for eg. and you want to know what are the functions this object can give us. so we come to see that there are two more methods get and get_next for us to use! Get the names and default values of a Python function’s arguments. A tuple of four things is returned: (args, varargs, keywords, defaults). args is a list of the argument names (it may contain nested lists). No more head breaking folks!